What sets this Hop apart from others, is our Feature. Each week we will showcase a Featured Blogger, from all different genres and areas. Who is our Feature today? Find out below. Just remember it is required, if you participate, to follow our Features and you must follow the hosts (Parajunkee & Alison Can Read) as a courtesy. How do you follow someone? Well, if you have a preference, state it in your #FF post. A lot of blogs are transitioning to Wordpress in which they do not have the luxury of GFC, so an RSS subscription is appreciated or if you choose an email subscription. If you don't have GFC please state in your post how you would like to be followed. I started blogging almost a year ago. Actually, my one year blogoversary will be happening on the 12th of this month! Time has really flown by. I started after finding out about reading challenges (and realising they were easier to do with a blog) and happened to stumble across a few blogs and then I thought of making one myself. I like to think I’ve come a long way in a year and learned a lot about blogging, reviewing, publishers etc. I love blogging and I’m quite proud of myself for sticking to it for a full year even though I’m quite busy in my personal life. I love the book blogging community and love books and reading in general so it’s always fun and never ever a chore. Writing posts and having lovely comments off other bloggers especially when it comes to reviews. After spending ages writing reviews (and it takes me so long!) and worrying about its quality I love reading comments off others saying that they enjoyed reading it, or that they added the particular book to their wishlist. I also love my readers and followers. After creating my blog I can remember doing a dance of pure joy when I had my first follower haha. You could swear I had won a million pounds or something, but it was a great feeling! I've also met so many lovely book bloggers whom I consider friends, it's been great. 3. What is your favorite book(s)? The Lord of the Rings. Just pure amazing stuff. You should all read it and get lost in Middle Earth with all its adventures. I also love George R. R Martin's A Song of Ice and Fire series. It has been an obsession of mine since reading it. I just love epic fantasy. But also since blogging I've read some great YA books and my favourite reads of 2012 were definitely Throne of Glass by Sarah J. Maas, Cinder by Marissa Meyer and The Immortal Rules by Julie Kagawa. 4. What has been the best thing that has happened to you because of book blogging? Receiving books of publishers is up there with the best. I love Netgalley but when I had my first paperback book from a publisher in the mail I felt like I had made it haha! I squealed in delight when it came through the letterbox! I've loved having the chance to work with authors and publishers; it's been awesome. I’ve had the chance to read and review some amazing books so it is definitely one of the best things to happen! Q: What New Years Blogging or Writing resolution have you placed on yourself? I actually think I'm going to do a whole post about my blogging resolutions. Essentially I want to (1) comment more, because I've become bad about it; (2) write reviews more frequently, because I've become lazy; and (3) actually get serious about my blog redesign that I want to do. As for writing, I'd like to write more. I'd love to write original fiction, but for better or worse, fan fiction is what pops into my head most. I don't necessarily mind this since it's good practice. For the first time, I have a story arc inside my head that could actually become novel length. It's a Harry Potter fan-fiction - one of those canon missing moments. I've written a few chapters and am quite pleased with it. I want to write more before I start putting it up online. Having a long connected story is a first for me, since I usually write a lot of fan fiction one-shots. Happy Follow Friday! Come back at midnight CST for the Facebook & Twitter hop!! **Sorry to those of you having trouble with the linky. It's working fine for me. Try reloading a few times. When this issue has come up in the past, that usually fixes it. Or give it a few minutes and maybe it'll get better. I don't do resolutions, just the basic determination of not quitting blogging is my goal. Though I agree with commenting more. I can't wait for your post about your resolutions. No, you're not. The linky isn't up here, and the post isn't up at Parajunkee. These are all goals that I have for myself as well. I'm always telling myself I'm going to totally redesign my blog. I don't see the Linky sign up thing. ??? Am I the only one? I would love to see you goals for 2013 post! I read fan fiction so much when I was younger. I actually read Newsies fan fiction (I was addicted!). If I were a writer, I would totally write fan fiction. To make stories end how I want them, or to develop a story for a secondary character. In the meantime, trying to enjoy the Journey (my 1 word for 2013) and focus more on what I've done and less on what I have not accomplished! Looking forward to seeing the changes you make in 2013! Great resolutions, very simple but obviously it requires a lot of work. Great post this week Alison!! Another great question Alison! I like your response and good luck with the writing. Wonderful goals :) And Happy New Year! Alison we no longer have the Mr Linky? Anyhow, I love the question this week as I've made huge Blogging Resolutions! Here's my Feature & Follow Friday post. Great goals set! Im interested in your writing you should post snippets here :) Look forward to reading more of your reviews! Good luck with the writing. I've never tried writing fan fiction. Sounds cool. Looking forward to reading more on your resolutions. Thanks for letting my being featured :) Great question this week too :) Good luck with all your resolutions! I love this first question for the year! Very apt. Nice! Sounds like you have it all planned out! Thanks for hopping by! I get lazy about commenting, too. I definitely need to do more of that! Thanks for hosting Alison & congrats to Lost in Thought for being featured :D Love the LotR answer & most of the '2012 favorites' reads mentioned are on my reading list for 2013! Great resolutions all around! Great resolutions! I hope to be able to read the HP story of yours someday. I really like what you say about fanfic being great practice. Couldn't agree more! Great resolutions :). I'm the same on reviewing and commenting! Shame Linky doesn't seem to be working :(. I've gotten a touch lazy with my reviews too Alison! Well, maybe burnt out is a better way to describe it, but either way I haven't been writing as many reviews lately. I think my goal this year is to keep it to 3 a week. I'd been bumping it up to 4 and that was just too hard for me to keep up with, so I'm going back to three after taking a little reviewing break:) Hope you have a great weekend! I don't have any, resolutions aren't really my thing. I been refreshing for a while and cannot get the linky to work at all. Great resolutions though :) I wish you luck with them! Yea, I can't get the linky to work from either page. Alison this is so fun I want to join in some time. Do you guys post the list of prompts anywhere or do we just check on the party day? and followed all the required ones :) Thanks for all you who will pass by my blog in advance & follow. We have similar resolutions this year! As for your writing, I hope your HP story online soon because I would love to read it. Old follower. Great resolutions...I think a lot of us have similar ones! Also, good for you with having aspirations to write! 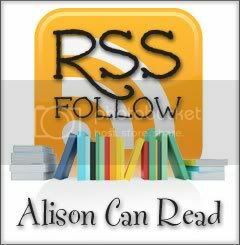 Thanks Alison for stopping by and commenting on my FF post. The linky still isn't working for me, and I've tried another browser and re-loading. Parajunkee also doesn't have the linky. For those that want to use the linky, some bloggers have added Feature & Follow Friday's linky on their blogs, one that I can view isJC's Book Haven. You can add your FF post on the linky there and also use it to follow others. All very good resolutions! I really need to comment more, I'm so slack at it at the moment! I also want to post more reviews, why is it that we can read a book in a day but reviews sometimes take us weeks or even months to get around to? Congrats to lost in though! I've been trying all day to find the Linky, still no luck. Good luck with your goals Alison! !